Never before have I bundled Brady P. and I up daily to continue our rock throwing/lake staring fetish into the winter. Usually once the snow hits, I reason that rock-throwing season is over. We still go each day, and I am grateful. 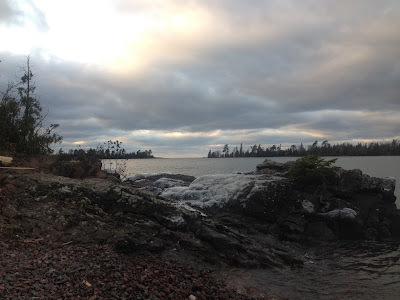 One day, as we sat on the beach by the Harbor Haus, I noticed that the wet rocks only came back about 2-3 feet which meant Lake Superior was relatively calm. The rocks beyond that, however, were covered in a thin layer of ice. Braeden eyed up a nice sized rock, and swooped his hand down to fetch it. His hand came up, but the rock stayed put. He tried a different rock to no avail. 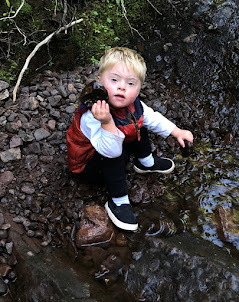 After one more try at a stuck rock, he looked up at me and let out a disapproving "Ah!" All the "dry rocks" were frozen solid in a single mass. Solid. I couldn't even kick some out to get him a pile. Instead, I bulldozed some wet rocks over with the side of my boot to give him a workable pile. By that time, however, he was over it. He was just staring at the waves. I sat down beside him and did the same. Though we sit at that exact spot several times a week, that day was different. I just couldn't believe what I was experiencing. There we were, both bundled up like marshmallows, sitting on a beach of frozen rocks. My three-year-old son and I stared, mesmerized by the largest fresh water lake in the world. I thought, "Man, how many people can come out here with their young child and meditate on the rhythm of the waves?" I watched Brady P. with great awe as he sat like a frozen stone himself with his eyes fixed on the great water before him. "How did I get so lucky?" I asked the air. As my eyes shifted up toward the sky, I also realized another thing about my current situation. I noticed that I could see the light between the clouds. Even though nearly everyday is a gray day, I can find the hints of sun penetrating the thinnest spots in the clouds. The spots that let just enough light in to remind us that, yes, the sun is still out there somewhere. That realization in itself is going to get me through the winter in a much better mood than I have ever had before. Thank you, sun for always shining. And thank you, Brady P. for showing me how to focus on the light. Definitely a beautiful, epic view! Thanks for sharing Amanda.